Keeping the demand of our clients in mind we are offering an extensive array of Precoated Profile Sheet. This sheet is designed and manufactured with the help of premium quality raw material and advanced technologies. 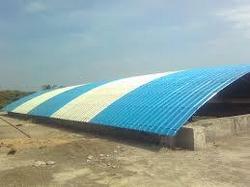 Our sheet is also tested on various parameters by our quality controllers assuring its strength and durability. The offered sheet is highly appreciated by our clients due to its reliability and various advantageous features. Clients can avail this sheet from us as per their requirements. Incorporated in the year 1995, We “MPC IMPEX,” are known as the prominent manufacturer, exporter,supplier, distributor, wholesale supplier, dealer & retailer of a qualitative assortment of Plywood, Film Faced Plywood, Teakwood, Wooden Flush Door, MDF Board, Pre-Laminated Particle Board , Aluminium section, Architectural Hardware & Fittings, Aluminum Extrusion, Acrylic Solid Surface, Shower Cubicle, Toilet Cubicles, Aluminium sheets & Coils , Gi sheet, Precoated Profile sheet, Polycarbonate sheets , Building Construction Material etc. The offered product range is precisely designed and manufactured with high precision as per the set quality standards utilizing premium quality raw material such as Wood, Aluminium , Acrylic Solid Surface, Building Material etc. with the help of sophisticated technology. The raw material that we used to manufacture our product range is procured from certified vendors of the industry. These products are widely acknowledged for sturdiness, corrosion resistant finish, termite resistant, high durability and dimensional accuracy. In addition to this, the offered product range is available in various sizes, dimensions and shapes at reasonable prices.